Dieting has never been our strong point and we were so touched by this rhyme sent in by a reader that we immediately sent her a copy of the new book Colour me slimmer that we find so inspiring. 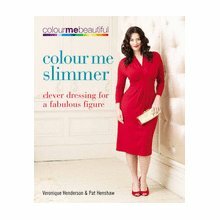 Colour Me Slimmer is about clever dressing for a fabulous figure, whether you are size 12 or 22. Here’s a book that banishes baggy tea shirts, rejects dangerous crash diets. This essential style guide demonstrates that by simply wearing the correct clothing for your body shape, you can shed pounds in seconds. To enter the draw send an email to editorinbalance@me.com with Colour me slimmer in the subject box and your full contact details in the text box, to reach us by latest 30 April 2011. One entry per household.